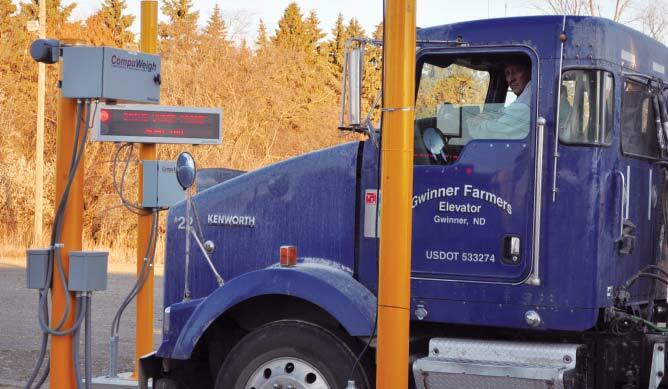 Driver awaits instructions from a CompuWeigh SmartView message board on where to deliver his load at a Full Circle Ag grain terminal in Forman, ND. Truck receiving operations are now under the control of a CompuWeigh SmartTruck automation system. Photos by Ed Zdrojewski. When two Upper Midwest cooperatives – Gwinner Farmers Elevator in Gwinner, ND, and Four Seasons Cooperative in Britton, SD – merged in March 2011 to form Full Circle Ag, it freed up a lot of capital for improvement projects. “We were looking to speed up truck receiving operations at our rail terminal here in Forman (ND),” says Jim Gallagher, grain operations manager at Full Circle. Gallagher has been at Forman with the Gwinner Farmers business since 1991. To that end, the company in 2011 installed a new Intersystems probe capable of sampling two trucks and a new 120-foot Webster Scale pit-type scale to serve inbound trucks, Full Circle now utilizes the original scale for outbound transactions only. More comprehensively, Full Circle tied all receiving operations at Forman together with a SmartTruck automation system from CompuWeigh Corp., Woodbury, CT (203-262-0400). Gallagher notes that the cooperative already was familiar with CompuWeigh products and services, since rail loading operations at Forman already were under the control of the supplier’s Grain Management System (GMS). One major result of the switch to SmartTruck – the daily volume of trucks that can be handled at Forman has doubled, Gallagher says, from about 200 to 400 trucks per day during the 2011 fall harvest, with no increase in manpower. From arrival to departure from the property, trucks average about six minutes, compared to 10 to 12 minutes prior to the installation of SmartTruck. capacity and loads trains on the Canadia Pacific. Full Circle issues a single RFID card to each truck. Each card contains a unique RFID number, which ties the RF card to each truck. Incoming trucks pull up to the probe, where the RFID card is read automatically. The probe attendant asks the driver over a SmartTalk intercom who he or she is hauling for (contract, splits, etc. ), and from this point forward, a human will not be required to identify this truck again. All transaction information is displayed on a SmartView message board for the driver to confirm. The truck pulls onto the inbound scale and is identified automatically from the RFID card. Photo eyes confirm that the truck is on the scale, transactional data is displayed once again on SmartView, and the truck automatically is directed to the correct receiving pit utilizing CompuWeigh’s SmartChoice pit selection module. After dumping the load, the driver returns to the outbound scale. The system once again automatically identifies the truck from the RFID card, photo eyes confirm the truck is on the scale, and the OTP-4600 outdoor ticket printer prints out a scale ticket and conveys it directly to the driver within arm’s reach of the cab. Again, a SmartTalk intercom is available, if the driver needs to talk with anyone in the office. 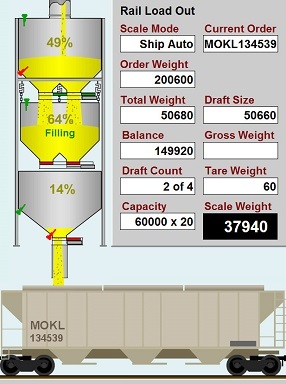 The facility’s Agvance® grain accounting software is tied into CompuWeigh’s GMS software through a bidirectional interface. This avoids any duplicate entry of data and reduces errors.